I would like to sell a few guitars that I don't need. It has been a joy and a privilege to be able to buy and live with them; far better than a few minutes in a guitar shop. Here are a two easy decisions. 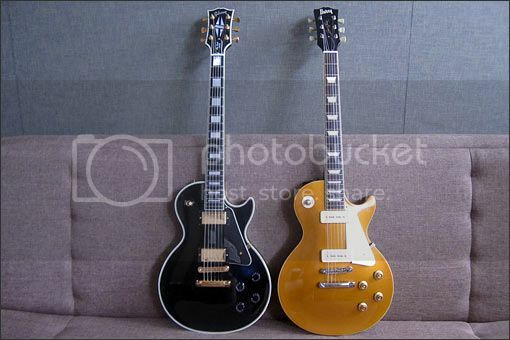 The £300 gold top Burny RG with P90s versus the £2,000 Gibson Les Paul Custom black beauty. I have had the Burny longer, used it every time when gigging over the Gibson, due to familiarity and not wanting to damage a £2,000 guitar, so the Burny will be staying with me and the Gibson can be sold. I bought the Stagg 4 string fretless bass to try out when I joined an acoustic band. The band loved the sound and I like the feel of it so it will stay. The StingRay5 can go as it doesn't get used as I now prefer to play fretless. However, I love the tonal possibilities with the active electronics so maybe I will look for a 4 string active fretless bass in the future. 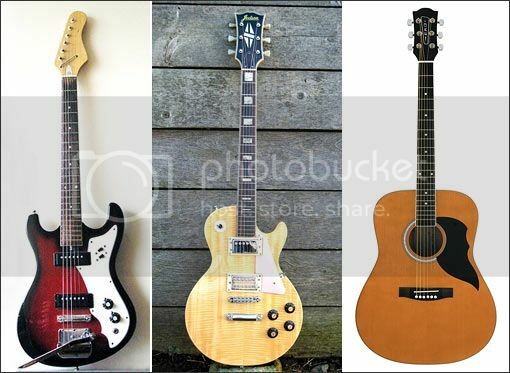 There isn't much of a market here in Slovakia and shipping would be around £80 for each guitar so I will bring these with me when I come to the UK in July to see if I can sell them, either direct to new owners or to a dealer. Somebody is going to be getting some beautiful new instruments. Sadly, not me, I'm afraid. Not that I don't want (need isn't a word, here... ) an LP or Stingray. I'm sure you understand, Lester. Since we moved to the new forum software the images in imported opening posts no longer display. Here are the non-displaying images from my OP with a brief recap. Fuller story in the OP, if you are interested. 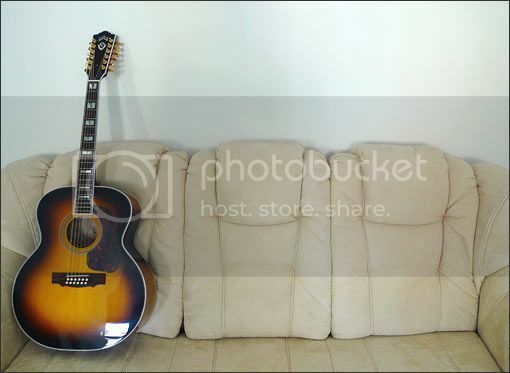 Missing image no.1: Zenta (sold), Jedson LP (sold), Eko Ranger 6 (sold). 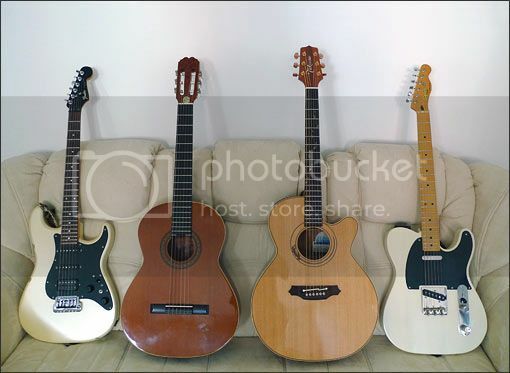 Missing image no.2: Strat, classical (sold), Takamine, Tele. Missing image no.3: converting a classical guitar to a thin-bodied classical. 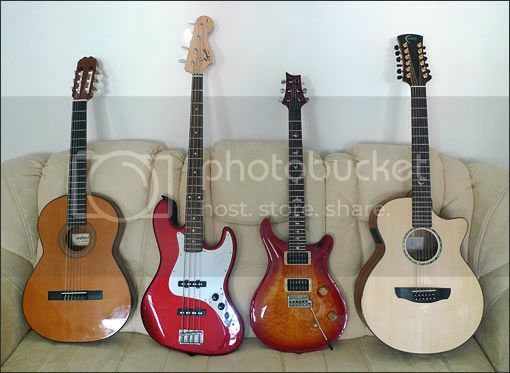 Missing image no.4: Thin classical, Squier bass (sold), PRS custom 24, Faith 12-string. 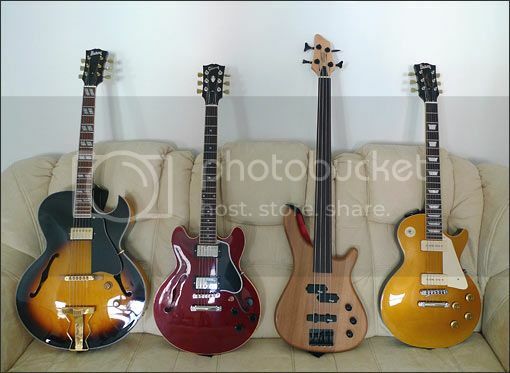 Missing image no.5: Burny archtop, Gibson ES-339, Stag fretless bass, Burny LP with P90s. 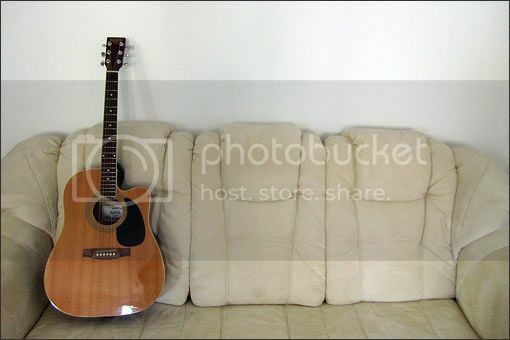 Missing image no.6: Guild 12-string. Missing image no.7: If I could only keep one, this would be it. MusicMan StingRay5 bass, bought to try out 5 strings and also active electronics. The PRS 305 is a backup for my Strat, YouRock Guitar is a plastic MIDI guitar. Godin multiac nylon, yet another impeccable guitar from Richard's Guitars. Gibson Les Paul Custom, which has proved that I am not a Gibson man. 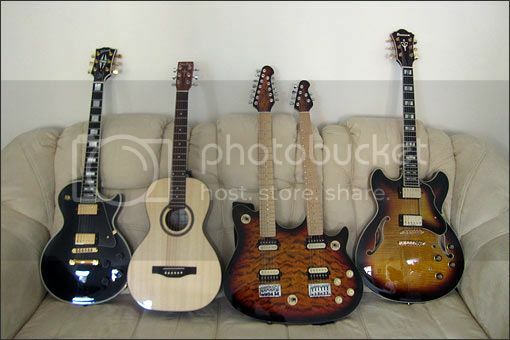 S&P parlour from Richard's Guitars as I needed an electro-acoustic guitar when my Takamine's preamp died, OLP double neck, Ibanez AS153 as a possible replacement for the Gibson ES-339 as I don't get on with Gibsons. When I got married, 2 years ago, my wife brought to the marriage this dreadnaught. It has the lowest action I have managed on any of our guitars. Now back to my thinning the herd. What will be next? Okay, to the third and last major decision I wanted to make right now - because I will be driving to the UK in July with the ones I want to sell. 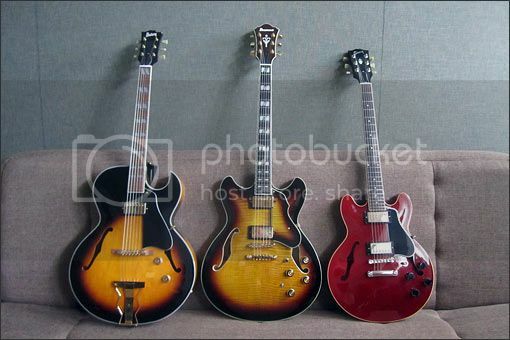 The Gibson Custom Shop ES-339 (on the right) was my first Gibson. 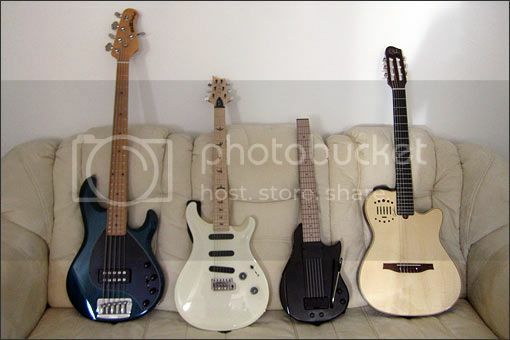 I have never really bonded with it and have been ready to let it go for quite a while, although I waited until I found a worthy replacement, which I now have in the Ibanez (in the middle). The Burny archtop (on the left), from Richard's Guitars, has been a truly wonderful guitar but I don't really need it as I can get the Burny's sound (and more) using the Ibanez, so I will be saying goodbye to a good companion. I prefer the slimmer neck of the Fender Strat to the chunkier neck of the PRS 305. I never expected to want to sell the 305 but it gets left in favour of the Strat, so it can go, sadly, as it is such a quality instrument, but with no regrets. 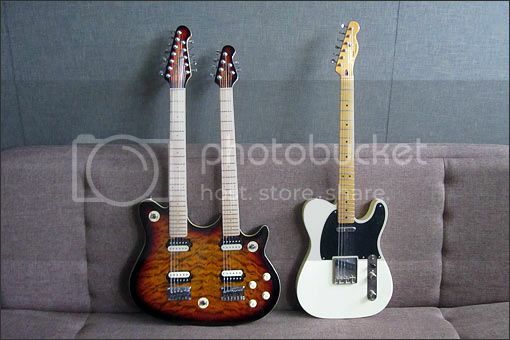 I can add two more that I am happy to say goodbye to: the OLP double-neck is an ok guitar and the Squier Classic Vibe 50s Tele is as good as people say the CV series is, just I now know what specs I would prefer for a Tele. So, that means I will be selling 7 electric guitars (Les Paul, bass, archtop, ES-339, PRS 305, double-neck, Tele) and keeping 5 (Burny LP goldtop with P90s, fretless bass, Ibanez AS153, Strat, PRS Custom 24). In the future it would be good to do the same with the acoustics: Guild and Faith 12-strings, Takamine 6 string and S&P parlour, Godin and Adamas nylon string guitars. I almost forgot my wife's dreadnaught. It has been so good of you all to let me ponder on my decisions openly. Thanks for bearing with me; it has been helpful. I must say I admire your common sense approach, and resolve in knowing when it's time to move guitars on - as you know, I find it very hard to let them go. I can remember you getting that Burny archtop, and also the PRS - both lovely instruments, but I'm sure you're right that if they are not getting used, then best to find them new homes. I have to admit for myself that I seldom play my own Ibanez JP20 archtop these days, although it does have a certain extra acoustic woodyness - and I seem to enjoy the extra bit of sustain you get from a solid body or semi acoustic. I do find that CV tele quite appealing, and with sensible specs for a tele. What are the things about that one you're not keen on? Just interested, not questioning you judgement! I do find that CV tele quite appealing, and with sensible specs for a tele. What are the things about that one you're not keen on? I think ultimately it comes down to personal preference if you want to be polite, or my being fussy if we are going to be direct! I have read many reviews about that guitar since I got it in 2009 and they all praise it, so I think it is me. I prefer slim necks. The CV Tele feels chunky to me. I read that there is now a Fender neck on newer CV Teles called a Modern C shape. I need to get to a shop and try out a few Tele necks. It weighs 4.1kg which is not overly heavy but apart from the black Les Paul at 4.8kg it is noticeably heavy when playing longer gigs. I would probably now choose a chambered Tele (but not a Thinline). As a Strat man, I appreciate the tummy tuck and the slanted arm top. I see it is now possible to have both on a Tele. The traditional ashtray bridge has little allen-key screws to adjust the saddle height and as someone that does a fair amount of palm muting, I can scratch the side of my hand quite painfully if I play this guitar too regularly. The fingerboard is not so much maple as laquer and I am not brave enough to sand the laquer down to wafer-thin. The PRS has a maple fingerboard that feels like wood. Others have rosewood fingerboards that feel like wood. I should probably have changed the Tele jack socket for a Les Paul style socket as I have to retighten it too often. The top string chokes if I do bends above the 12th fret. Individually they are all small points, some of which could be fixed. Overall, I think it would be easier to sell it as a stock original CV Tele and go and find a shop that has many Teles including chambered with the tummy tuck and arm slope, different bridges, different neck sizes and fingerboard finishes and discover what specs I really would like in a Tele. On the one hand, I think I know better what suits me. On the other hand, I must be in the minority as the items I have mentioned are not mentioned in reviews as points that Fender could or should have improved. All the same, it doesn't make it a bad guitar, it makes me a bad workman who blames his tools! I think those are all fair points you make Lester, and thanks for taking the time to answer my inquiry so thoroughly. Tele necks can be chunky in profile (my existing partscaster is like that) and that's a fair consideration to have. And yes the slab body design isn't always the most comfortable thing, although that does depend on things like strap height to some extent. The ashtray bridge on my Tele (a Wilkinson brand one) doesn't have the saddle allen screws protruding, but I hate it when they do on any guitar, so totally with you on that one. And I understand your feelings regarding the heavily laquered fingerboard - I think I'd probably be fine with that, but it's a reasonable individual preference. Your right about the traditional tele jack socket - it is a pain, and I think only used any more for aesthetic/authenticity reasons. As to the string chocking, that's an interesting one - my own findings are that the vintage 7.25" radius fingerboards are hopeless in terms of getting a remotely low action without chocking notes on bends - it's just not possible for reasons of simple geometry. The 9.5" radius ones are a lot better, but can still need a little compromise, and having the frets well leveled and dressed does help enormously too. I do get by fine with the 9.5" fretboards on my partscasters anyhow, but ideally something like a 12" or more radius is probably the way to go. As to reviews - of limited value at best I reckon. The CV Tele has a 9.5" radius neck. That is one more thing for me to bear in mind for the future. Thanks for mentioning it, Megi. I noticed your bridge and on some other Teles. I have often wondered whether it is more comfortable. Another reason to get to a shop and try quite a few. Before you know it I will be looking for a luthier or someone that can build me my dream Telecaster! Cheers Lester - I'm very glad if my thoughts re fingerboard radius prove useful for you, and pleased I did mention it in that case. Incidentally, I was just having a strum on my ash-body tele yesterday, without plugging it in, and it does have this certain kind of distinctive "zing" or chime to the tone - I compared it to my ash body strat, and that's still resonant, but in a smoother way. The difference is quite apparent acoustically anyhow - I suspect the ashtray bridge, and very possibly the brass saddles, on the tele do have some impact on the tone of the guitar, so maybe that is a feature one should try to keep for full "tele-ness". ...or maybe not, it's just speculation, but I mention it for what it might be worth. I'm another that struggles with the thick layer of finish on many maple fingerboards, and the ash tray bridge for palm muting, and the chunky unforgiving body shape. i have an AVRI52 that suffers all these and wouldn't choose to do a whole gig on it for that reason. 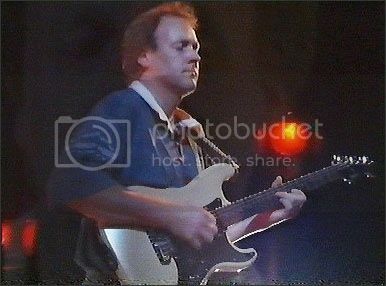 But as a flavour and contrast the sound is classic in every way so I take it as one of three guitars to most gigs. If I'm honest I would probably consider and early 60s style with a rosewood fingerboard for comfort, I've played a few and they seem very nice although the slab body and ash tray bridge remain and the bit and growl of the PUs is a little more polite. I decided that after all these years I should treat my Strat to a better case, it having had to put up with being transported about in a gig bag for the last 28 years! 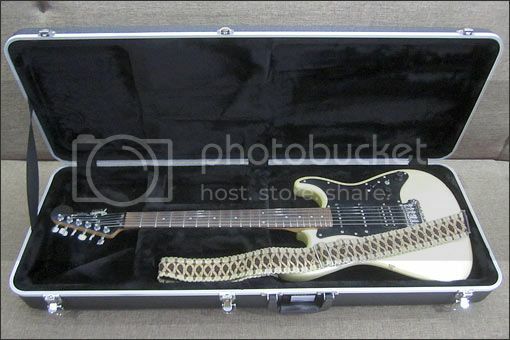 I bought a Gator hard case which is great as the Strat fits it precisely, no room for wobbling and the neck is supported for most of its length. Nice choice, Lester. I have one of those and just love it. It's a great case. Like you said, it seems to hug the guitar rather nicely. 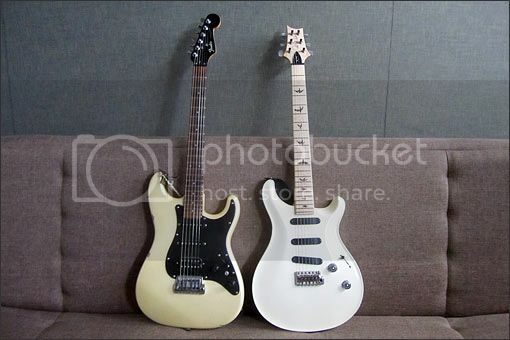 That white PRS looks gorgeous. I didn't known they made single coil models. How are the pickups on that? That white PRS looks gorgeous. Everyone says that. If Miss World walked into my life tomorrow, despite her amazing looks, I would have to say that my wife, although not perfect, is in fact perfect for me, and that is why I am letting the 305 go and keeping the old Strat. I didn't known they made single coil models. How are the pickups on that? The 305's pickups have been described by others as like a Strat on steroids. Being a Strat player I don't hear the similarity other than the obvious: the relative change in sounds with a Strat style 5-way selector switch. I kept the pickups as low as they would go to tone down the steroids. There are YouTube videos, official PRS demos even, of people playing 305s. I don't think a bad sound is possible from a 305, it really has a great range of tones, even if it is not exactly a Strat imitation. PRS stopped making the 305 (3 pickups, 05 voices) and the current model is the 509 (5 pickups, 09 voices). I guess you'll be wanting a PRS 999. Nah, miss world would just go on about world peace or something. It would be boring talking to someone who needs a script and pre-written answers. I'm not surprised they stopped making 305s as they don't really fit in the PRS catalog. I'd love to try one out, but I'm sure YouTube is as close as I'll get. I could look out for the pickups on eBay. 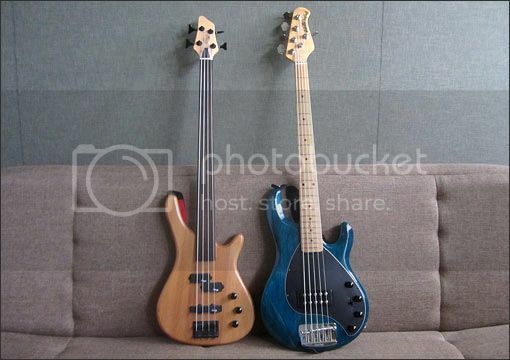 I forgot to add that there has been one newcomer to the family, a Kala U-bass. U stands for ukulele and it is the size of a baritone uke. It is made of solid mahogany with walnut fretboard and bridge and nice details like a Tusq nut and tortoise shell binding. The strings are polyurethane; basically they feel like soft rubber. Acoustically it is plain and quiet sounding but through an amp it sounds like a double bass. 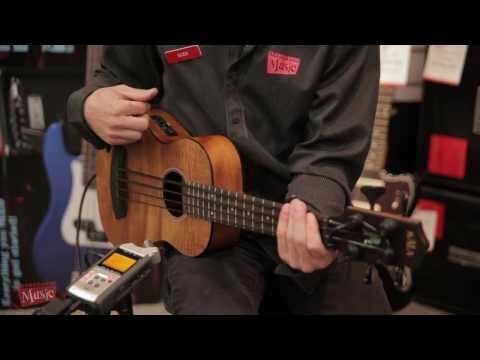 Here is a great 5 minute video from an Australian music shop demonstrating it, in case you are curious. The U-Bass instruments can be very effective. As you say, plugged in rather than acoustically. Much kinder to the fingers with less stretching to frets! Something of the double bass as you say. I opted for slightly lower budet than teh Kala - went for a Countryman. 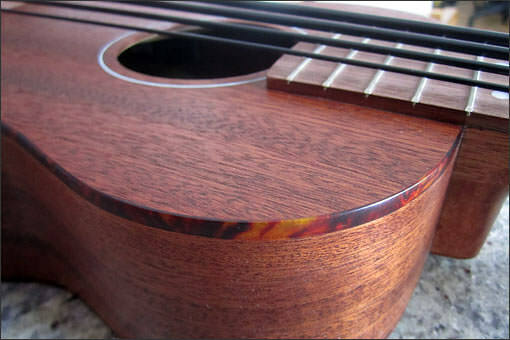 All mahogany with a rosewood fingerboard. Took a while to get used to the feel of the strings. An improvised bass line first track, then 3 note chord shapes on guitar using scale notes, but avoiding normal chord shapes, then final track a more melodic style lead line. Fun!!! That is an interesting track, Mark, with each instrument sounding lovely and the combination of them together sounding very experimental. The bass does indeed sound warm and full yet in no way vague, as I would have expected. Thanks Lester. The sounds blended nicely I thought and the Vintage Giltrap Acoustic was perfect on chords and lead for the style of the recording. It was a fun recording to make and was based on an improvisation teaching idea by David Wallimann. Rough outline is you choose a key / scale and play a bass line concentrating more on rhythm than any sort of bass patterns - in fact avoiding patterns. Then you pick out three note chords from notes in the scale, avoiding any chord shapes you know. Then try to put some sort of lead line over the top of those. It involves listening to what you're hearing and playing very closely and that focus means losing yourself in the music. I do know I could not have deliberately created this piece by planning / writing it down. I also know that i couldn't have played it if it had been written down for me by someone else. I love the surprise element of things like this where what you end up playing is unexpected. The u-bass sounds great! It would be a fab portable guitar. I could have done with a bass at a family picnic today, in fact. About 2 years ago I sold my Jazz bass to try my hand at 5 strings and active electronics. 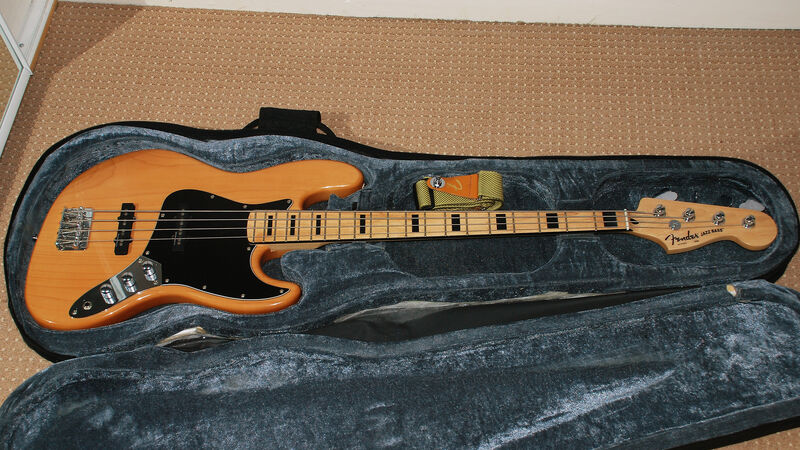 I discovered that neither really suit me and so, after thinking about my old bass for some time, I contacted the chap I sold it to just say that if he ever wanted to sell it I would be interested in buying it back. He replied to say that last year he got married and now lives in another country and that his unused bass is at his parent's house in the town in which I live. Today he returned home to visit his family and I went and bought my old bass back. It feels so nice. This time I plan to keep it and upgrade the pickups and nut to make it a better sounding guitar. Nice Lester. It’s good to have old friends back. Nothing wrong with a Squier bass either. My brother was parting with one of his basses and offered my grandson his choice of the two. After a couple of days playing the two he chose the blonde, maple necked bass, which is actually a Squier. I had previously altered the headstock to read "Fender" as it was my brother's choice when gigging and he had heard comments like, "it's only a Squier" and "it's only a cheap guitar". Which shows there is nothing wrong with a Squier, as it was both their first choice for playing. I bet that was a tough choice. Very nice of your brother to pass one along to the younger generation. Is the black one a US or Mexican model? US model as far as I am aware.